This year’s Best Sandwich winners reflect broader consumer trends as chefs find a new twist on traditional menu favorites. Ingredients: Hormel Spam, pulled pork, white cheddar, pickles and whole-grain mustard on Cuban bread. 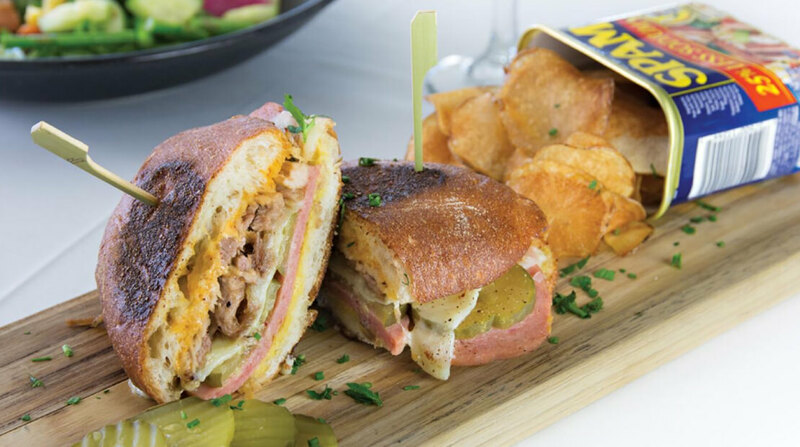 What makes it special: The Spam-ish take on the Cubano sandwich was made in collaboration with Jamie Hormel, who, along with her husband, the late Geordie Hormel (of the Hormel family who invented Spam) saved the historic Wrigley Mansion in Phoenix. She named the sandwich for her husband. Other than the fried Spam, the sandwich stays true to the classic Cubano, but on the side, the restaurant serves potato chips in a clean Spam can. What others are saying: “It’s the hottest item on the menu right now. I probably sell over 200 a month,” former executive chef Jason Diaz told Phoenix magazine in April 2017. “The signature Cubano sandwich made with Spam is a tribute to the current Hormel family owners, but is truly delicious. Worth it,” Jane1544 raved on OpenTable.